Fairly rugged and offering a premium look and feel, HP's ProBook 4720s features a balanced, high-performance component set with comprehensive and easy to use applications. Added to its respectable battery life and above average value, this business laptop's few flaws become easy to forgive. The ProBook looks great and has some useful security features. We were impressed by its battery life, but its weight means this isn't much of an advantage. This, in addition to the poorly designed touchpad as well as a miserly amount of RAM and hard disk space, prevents the ProBook from receiving our unconditional recommendation. The HP ProBook 4720s is a worthy replacement for the older 4710s. Performance increased with the newer Intel Core i5 processor over the older Core 2 Duo, and the newer ATI Radeon 4350 gave a small bump in speed over the previous 4330. The two most important changes are the newer metal screen cover and the significantly improved battery life. Compared to the older plastic lid, the new metal cover reduces flex and adds a great deal of protection. Battery life is another huge change, going from a bit over three and a half hours to 4 hours and 48 minutes. Overall we might have enjoyed seeing a slightly better graphics card as the 4350 only slightly outperforms most integrated graphics solutions. If you are in the market for a 17-inch SMB notebook, the HP ProBook 4720s is worth considering. Laptops designed to push desktops off the desk have come a long way from the behemoths of bygone times. A case in point: the HP ProBook 4720s ($1,059 as tested), a slick black beauty that can actually be used comfortably in a lap. 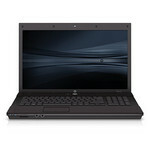 The base price for a Core i3-based ProBook 4720s is $975; our Core i5 review configuration sells for $1,059. At either price, if you're thinking of making your next desktop a laptop, this muscle machine is worth a tryout. The ProBook 4720s combines solid performance, strong graphics, best-in-class security, and surprisingly good battery life in a neat 17-inch package. An inaccurate touchpad and grainy video playback hold the system back a bit, but at $1,059 for Core i5 power and discrete graphics, this is a value-priced desktop replacement that businesses will appreciate. Una Mobility Radeon 4570 con aproximadamente un 27% menos de velocidad de reloj. Consumo de corriente de 8-12 vatios según AMD.